State Department spokeswoman says PA's resolution to "end the occupation" attempts to "prejudge the outcome of final status negotiations." The United States made clear on Tuesday that it is against the Palestinian Authority’s plan to submit a draft resolution to the UN Security Council calling for an end date for “Israeli occupation”. Nothing has yet been tabled at the United Nations, she noted in her remarks, according to AFP, "so this is a preliminary discussion. And obviously having a back-and-forth and hearing from them is part of the reason to have a meeting." Urging the UN to call for an end to the Israeli occupation "contradicts their stated goal of a two-state solution and having their own state, an aspiration we support," Psaki added. Earlier Tuesday, a senior official said the PA would submit the draft resolution later this month. The PA has been under intense pressure not to push forward with the Security Council resolution, which Washington would have the power to veto. In response, chief negotiator Saeb Erekat declared several weeks ago that if the United States vetoed the PA’s UN resolution, the PA would apply for membership to 522 international organizations and statutes - in violation of previous treaties with Israel. 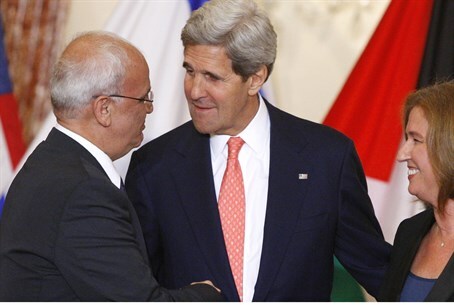 The plans for the resolution have been accompanied by threats from PA Chairman Mahmoud Abbas and his aides. Abbas recently threatened to cut ties with Israel if his latest unilateral move at the UN fails. Fatah leader Nabil Shaath recently threatened Israel with a “political war” if there is a negative response to Abbas’s steps at the United Nations.